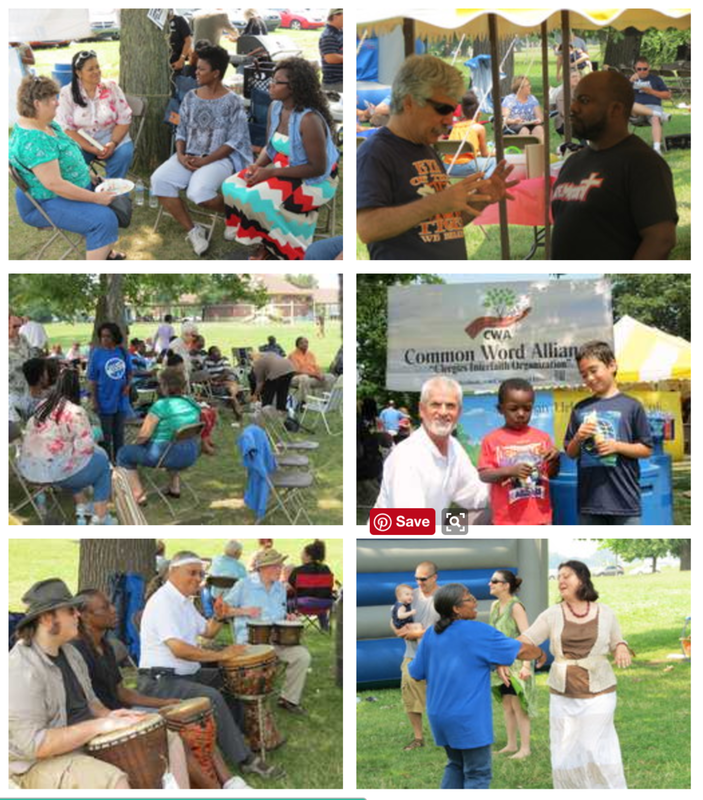 Close to three hundred people of many faith traditions met on Belle Isle on a beautiful Sunday afternoon, Aug. 3, 2014, for the annual Suburban-Urban Unity Interfaith Picnic. It began with prayers and songs for unity and peace in our community and the world led by Father Lawrence Ventline, Rabbi Dorit Edut, Cantor Roger Skully, Assistant Imam Arif Huskic, Rev. David Kasbow , Chaplain Yvonne Moore-Fant, and others. Teens played volleyball, while children did origami and enjoyed a Bounce House and other games, and adults socialized or did all kinds of ethnic dances, including Israeli ones, to the music of a Detroit female DJ. A huge feast of salads, desserts, and many side dishes was served under a big white tent, accompanied by grill favorites like kosher hot dogs, halal chicken, veggie burgers, and regular hamburgers. Maggid Steve Klaper led songs on his guitar, while Baha'i member John Suggs organized a drumming circle. A Bingo game for donated prizes was called by Barbara Emerson with proceeds donated to Warm-Up Detroit, an organization that helps the homeless at an NSO shelter in the city. Various groups that help families and children in the Detroit area had tables with promotional materials. Sponsoring organizations included the Detroit Interfaith Outreach Network, the All-Faiths Festival, Common Word Alliance, Bridging 8 Mile, and the Metropolitan Family Church in Warren.